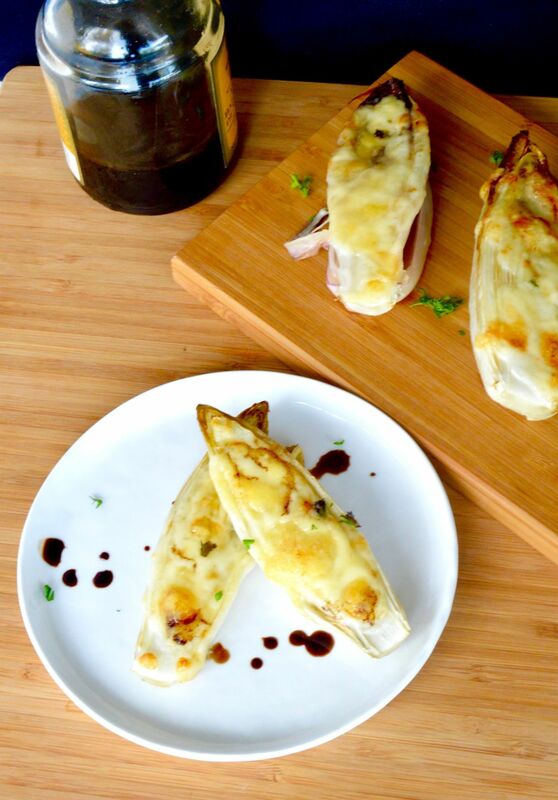 Cheesy Broiled Endive is an impressive, easy appetizer that only takes two ingredients! 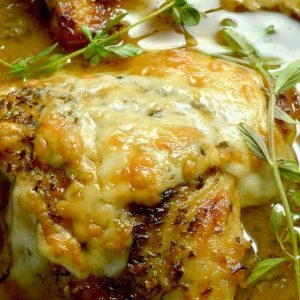 Topped with your favorite cheese it’s deliciously savory, filling and my favorite part…. Low carb!!! 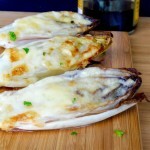 Cheesy broiled Endive is a recipe that my husband had talked about for years. He went to a restaurant in San Francisco years before he met me and it left a very lasting impression. Seriously, he would talk about this and how delicious and different it was. He described it as grilled radicchio with cheese on it. I set out to make what he described even thought the thought of grilled lettuce didn’t sound very good to me. I’m sure glad I did. I switched the recipe to endive because it was smaller and better suited for appetizers than radicchio. While the final recipe for Cheesy Broiled Endive I’m sharing isn’t made on a grill, I promise you that it is really tasty!! You can grill it, but I found broiling it in a hot oven gives a more even texture on the endive and less charring on the leaves too. The grill can also be somewhat hazardous with the melting cheese. 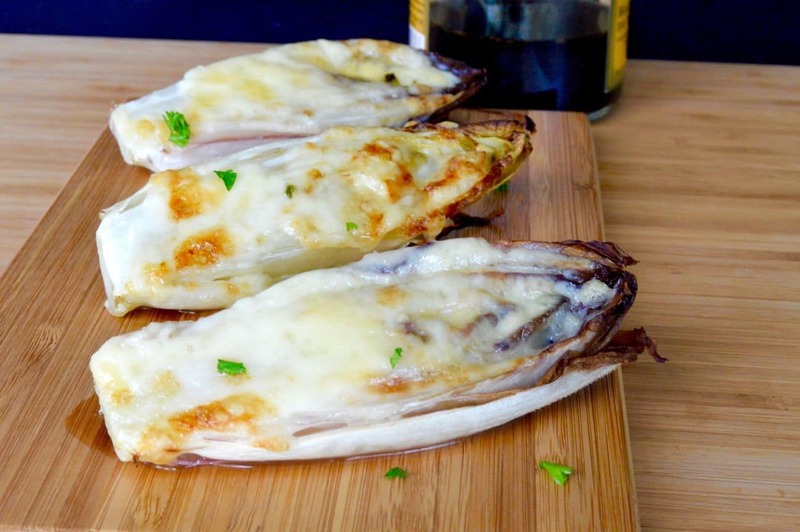 Broiling gives you a crispy golden brown edged cheese that works so well with the endive. The melted cheese with the very moist insides of the endive is a very different twist on an appetizer. I know this appetizer doesn’t look all that pretty, but I promise that if you try it, you will want it often. It’s become a fixture on our meal plans because it doesn’t have any starchy carbs in it. The cheese is a nice protein for those wanting a low carb high protein diet. Oh, and did I mention it tastes sooooo good? Versatility: Works as an appetizer or a salad for a meal. Options: Would work with Radicchio just as well. I just like the smaller pieces of endive for presentation for an appetizer. You can substitute your favorite cheese or your guest’s favorite cheese. Bonus: Low carb offering for those guests who are watching what they eat. Negatives: You have to make right before serving, but on the plus side you can set up the pan and have it ready to pop in the oven when you are ready so actually its not a negative at all. 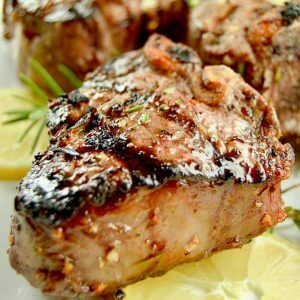 This would pair with your favorite wine or with this cocktail! Line a baking pan with crumbled up foil. You are going to use the foil to prop the endive so they don't roll over while baking. Cut the endive in half lengthwise, rinse with water and drain. Lay endive on foil lined sheet, very close together with the flat side up. Cover Endive with generous amount of shredded cheese. Place in the oven for 15-20 minutes until cheese is golden brown and bubbling. 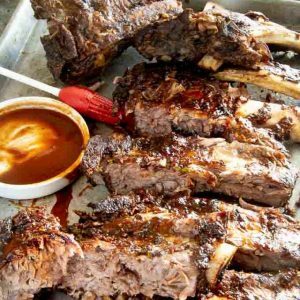 The nutritional information for this recipe was calculated in My Fitness Pall using the exact brands and ingredients I used to make this recipe. If you are following a strict diet, please calculate the information using what you used to purchase this. I love grilled endive! I have never thought to add cheese, what a great idea! I think my kids would even get on board with this! These appetizers not only look delicious but they are really pretty too. 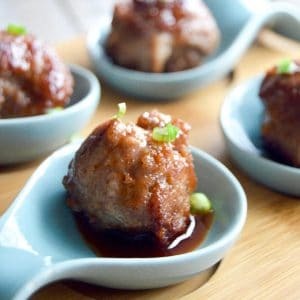 They would be perfect for serving to the entire family for family dinner parties and other get togethers. I’ve never tried endives. These look really good though, and it does look very filling! This looks so yummy! I definitely need to try them this weekend! I’ve never tried endives before but shayba great way to eat them. This is something I need to try this weekend. Love how simple it is. Thanks for sharing it with us. This sounds absolutely delicious. I am all about anything that is cheesy. This sounds like a perfect pairing of flavors. 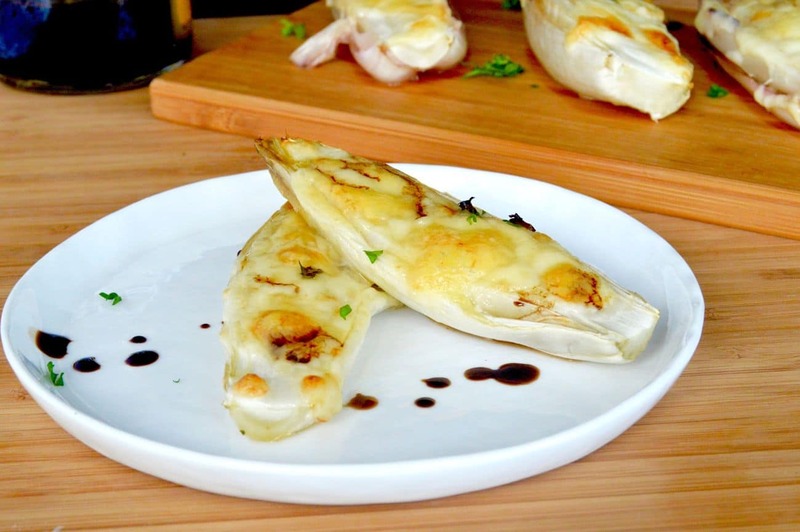 I’ve never thought about melting cheese on endive, but it makes complete sense. These look so tasty, and would go great with my next salad. I have never heard of these before but they sure do look tastey! Simple to make as well, always a plus in my book! I wonder if my kids would like this. They like to say that everything tastes better with cheese and you’ll be surprised at all the things that cheese gets added to. I might give this a try and see. This looks so fancy, yet with only two ingredients, I feel like I could easily tackle it before guests come over! I love recipes like that 🙂 Thanks for sharing! I know right? EASY PEASY! I don;t think I have ever tried endive before. This looks delicious, though! I may have to give it a try! I’m not sure our grocery store carries Endive. I am certainly going to have to check and try this out! This looks yummy but I’ve never had endive before but I love grilled romaine lettuce and if it’s anything like that, then I’m making it!! OMG yes! I love that these are smothered in cheese! I am definitely going to be making these and SOON! You had me at cheese! I have never seen an endive before and honestly I am going to have to ask the produce manager to point me in the right direction so I can find one. This would be a great new appetizer to try out this weekend. I honestly dont have many recipes that involve endive – so this is a welcomed addition! I like how it could be an appetizer, but I think I’ll try it out for a dinner! Seems fulfilling enough – and yummy! It is a meal that is filling for me….. my husband, not so much! Thats a good idea… the next time my husband is traveling I think Ill have this for dinner! We call endive chicory here in the UK and Belgium (where my family are from), and we love cooking with it. It’s great raw in a salad too though of course. Yum, my hubby would love this! Can’t wait to make it for him!! Oooh this does sound delicious. I’ve never bought endive before but I’ll be heading out to grab one straight away after a description like that haha. Thanks for sharing! Man I wish I’d had this for my mid-lunch-mid-dinner! Gorgeous looking appetizer, perfect to fill me up during the day!